To remix a legend is no easy task because the bar is already set so high, that even good remixers are often not up to the challenge. Here is Jack Conte, a talented producer and multi-instrumentalist, trying to remix not one, but two dance music behemoths at once, drawing from both of their catalogs and adding elements of his own in a remix mash-up spectacular. This remix is perhaps as ambitious as one can get, and Conte is successful in not only doing justice to the greats, but creating a funky, dirty, and innovative electro house track. As if the production of the song isn’t spotless enough, the video is also phenomenally produced. 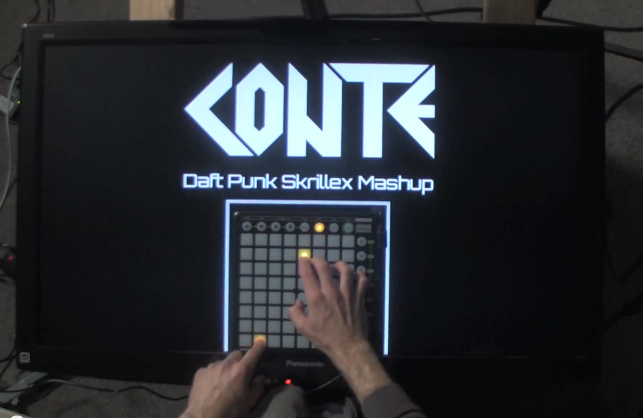 Conte’s music video takes on the Launchpad approach of Madeon’s notorious ‘Pop Culture’ video, but he adds in a whole new visual element in performing it on top of a TV with visuals that interact with the music and the happenings on the Launchpad. Throughout the whole video, Conte keeps us entertained with his creative remix and visuals. Look for this remix to pick up some serious traction in the next month before Daft Punk releases ‘Random Access Memories’. This mashup is a perfect pre-game to get yourself back in the Daft Punk mood.